I really love interactive books, if you haven’t noticed in the last 6 months or so. I love them because they can be used in so many different ways in the classroom. I recently asked folks on the Facebook page and they confirmed the many different ways they can be used. So, I thought I would share 5 ideas of ways I have used interactive books in the classroom. Let me say that there has been some discussion about what are adapted books, what are interactive books, etc. Sometimes these types of books are called one or the other. I tend to name them adapted interactive books to encompass both categories for search purposes on TPT. However, I tend to think of adapted books as ones where original books are adapted using visuals or extra text to help the reader. Interactive books are when there are moving pieces of a book that the students move around to keep them engaged and to demonstrate skills such as comprehension. I love both types of books but I’m going to focus on the interactive books but many of these activities can apply to adapted books too. I started making interactive books many years ago as a way to generalize skills from direct instruction to group activities. I quickly found out that they were also great ways to keep students engaged in the activities of a group. Because it gives the student something active to do during the activity, they are more likely to attend and interact. I include interactive books in my morning meeting activities because they work so well for engagement. 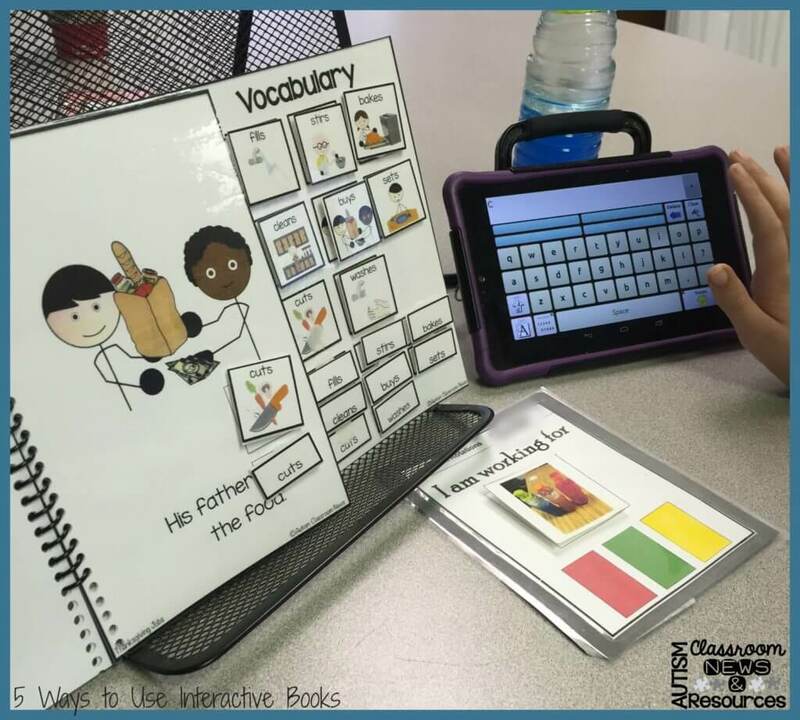 I use interactive books in 1-1 or small group lessons to work on a variety of skills. I use them to teach comprehension of the text by having the students find the pictures. I can use them to teach basic matching skills and receptive language. I also use it to increase vocabulary, so I try to use common words that the students will need to know and will come up repeatedly. I also sometimes use thematic vocabulary. With some I can also use them for expressive language where they have to name the item rather than finding the picture. Most of my most recent books have included words and pictures to allow both differentiation and to work on reading comprehension to match words and pictures. I will do a post in the future with some of the skills that can be addressed using interactive books and potential goals/objectives for them. I mentioned this one when I talked about group activities, but simply having the students work on vocabulary and other skills with a variety of different materials promotes generalization. I include interactive books in my generalization packs for that reason so that students can practice and demonstrate the skill in a variety of situations. This makes it more likely to maintain and that it will be used in the future. Some books include questions that the student is asked to communicate. You can work on expressive communication by having the students name items in the book or comment about something that happened in the book. You can then use the pictures or words in the book to cue communication. I’ve also used some books that have questions in them that the student is expected to answer, like this one about whether he likes hot chocolate after reading about how it is made. I use interactive books frequently by combining their low tech with their PECS or speech generating devices. In this picture, for instance, the teacher has the student read the page using the picture and then find the word on her talker. 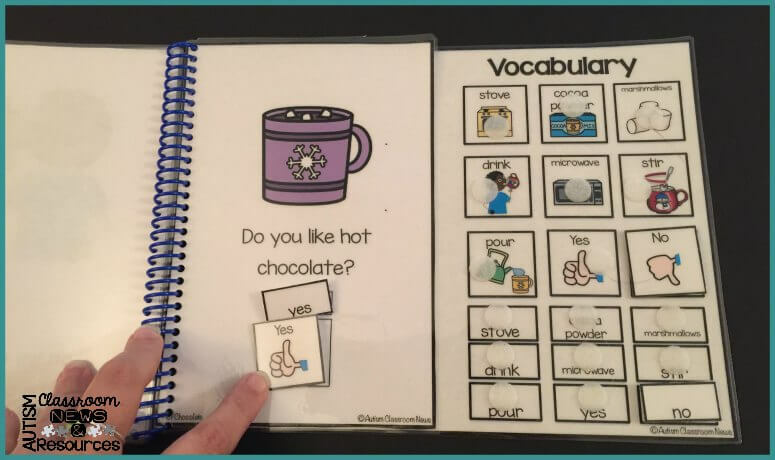 You can also program their device to say “turn the page” in a group activity or to answer the question like the hot chocolate example above. You can also use the pictures to have the students describe what they see on the page using their talker. So those are just 5 of the ways to use interactive books that I can think of. I will be back in one of my next posts with 5 more ways and then with some specific skills that can be easily targeted along with some goals/objectives that can be used with them. 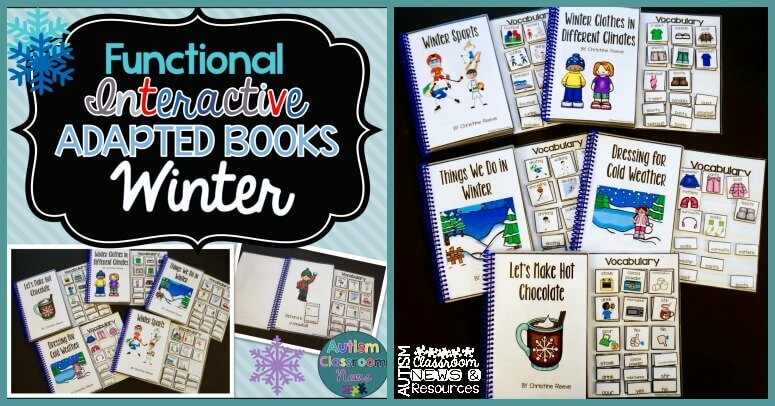 In the meantime, check out my winter-themed interactive books to try these ways out. 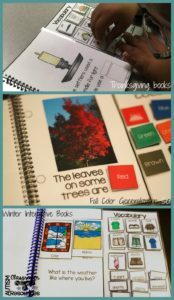 If you are interested in other seasons and other functional adaptive books, check the adapted interactive book category in my TPT store. 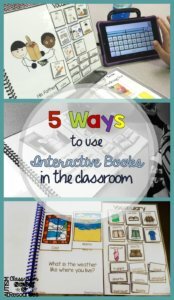 And check out 5 More Ways to Use Interactive Books in the classroom. There are other books out there that work on just matching the pictures as well. I use my Linguisystems books (see my sidebar) are very simple matching picture to picture books. Hope that helps. LeeAnn, there are a lot of interactive books that don’t require reading at all, where the student match pictures or provide one picture in response to another. None of my kids use spoken language and they have barely emergent literacy skills, for the most part, but I do a lot with interactive books. And, as Christine says, you can read to them, then have them supply the correct response. I like adapting regular story books, too, where the student matches a symbol to what you’ve read or what he sees in the illustration. Does that help, too?